Re: When to plant potatoes relative to last frost? Gary350 wrote: Potatoes are not hurt by frost so plant potatoes now and don't worry about it. Frost will kill the tops but not the potato plants under the soil. Tops will grow back over and over every time froze kills them. As long as you don't have a hard freeze that lasts for several days potatoes will be fine. Keep your plants out of the mud they do not like to be water logged. This is exactly why you want to plant after danger of frost. Potatoes use their stored energy (starch) to put up fast, early growth. Your goal as a potato gardener should be to produce the strongest, healthiest TOPS by the time the plant flowers and starts tuber growth, because your tuber (potato) production is directly related to how healthy/large your tops are. If you plant too early and frost kills your potato's first attempt at producing tops, it has to dig deeper into it's stored starches to produce another set of tops. This weakens the plant overall, and produces smaller tops by the time flowering comes along. Smaller tops = fewer, smaller potatoes in the ground. 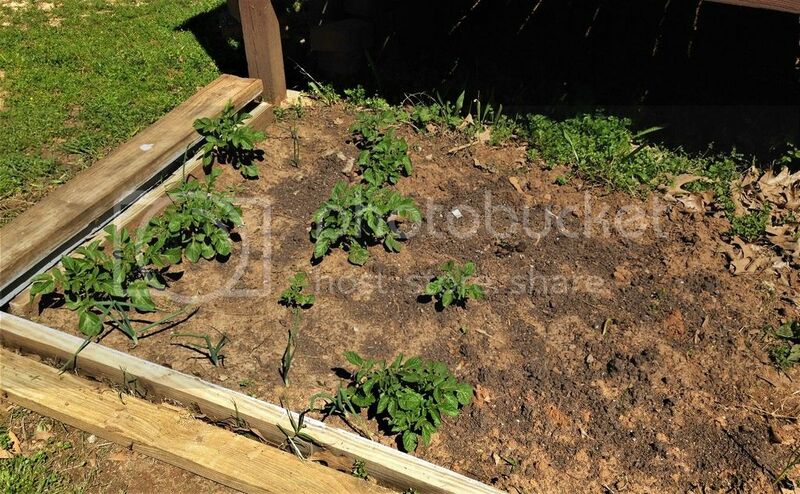 If you plant your potatoes after danger of frost and the plant has strong, uninterrupted growth from day one, you will have strong, large, vibrant tops that can produce large, abundant potatoes underground. Here's a pic of my potato patch one year. This patch produced over 100lbs of potatoes. The seed potatoes were planted well after danger of frost. I would not plant potatoes from the grocery store. (Good way to spread disease) Please try to find some certified disease free potatoes from a garden store to plant, or if you have your own potatoes that you have had in storage from last season and they were disease free, it is OK to plant these. Hilling potatoes: It is common practice with potatoes to hill them up about the time they flower and are ready to make tubers. The reason for doing this is so that tubers do not see the sun. If they develop close to the surface and sunlight hits them they turn green and get a strong yucky flavor. Taiji wrote: That's great news. What variety did you plant, just out of curiosity? I do the same thing grocery store garlic always does good for me. Last summer we had a bag of grocery store potatoes that sprouted in the pantry so I planted them in the garden they made 2" tall plants that stayed 2" tall for 5 months. I dug the potatoes up all that was there was a piece of potato with roots and a 2" top. That is the first time I every had trouble with grocery store potatoes. My 20' row of seed potatoes that were planted May 1st in 80 degree weather made 50 lbs of tops and 9 lbs of potatoes. I'm fortunate to have a farm type store here called Cal-Ranch. I don't know if they are a national chain or not, but the cool thing is they have certified seed potatoes every year in big barrels for about the same price as a grocery store potato; cheaper than some store potatoes. They have Russet, Red Pontiacs, and a third one, can't remember what. But, each variety for only .49 cents a lb. That buys a lot of seed potatoes! I always thought they got them in too late. But maybe you're right Bri. Your reasoning is sound. Think I'll save a few for warmer weather and compare crops. Still, last year I seemed to get equal harvest from both frosted and unfrosted plants. Here's the regrown potato plants. Six inches high and more than that wide, looking happy. barely visible in the dirt on the right are the tiny new sprouts of the second set I planted. Hard for me to believe they will catch up or do better, but I guess I will have succession planting of potatoes. I will add some more yet. Red Pontiac potatoes do very well in TN they don't seem to mind the 100 degree hot weather but we like white potatoes much better than Red potatoes. I have had potato tops killed by frost several times it never seem to hurt the potato crop maybe smaller tops require less energy so more energy going into making potatoes not tops. I use to grow a wonderful large crop of potatoes when I live in Illinois now I live in TN and my potato crop always seems really small compared to IL, I think this is normal for TN it is so much hotter here than up north. I have planted potatoes in September several times cover them with 8" of soil so they don't freeze and 2" of straw the tops freeze off and the potatoes set in the soil all winter Dec to April and there is always a good crop of potatoes. I have grown a lot of different type potatoes some do better than others in this hot weather. I have come to believe TN is to hot for most potatoes. My Red potatoes usually grow the size of a tennis balls a 20 ft row will fill a bushel basket full, my white Russet potatoes 20 ft row will fill a 5 gallon bucket. Russets probably do much better up north in cooler weather. Experiment growing different potatoes where you live and don't worry much about tops that freeze off they always grow back. Rainbow, they won't catch up, but assuming you're treating them the same and they're from the same quality of seed potatoes, the non-frosted-back potatoes should produce larger plants and thus a larger harvest (may require more hilling, too). Gary, actually the amount of tuber production underground is directly related to how big the plant is aboveground. This is basic common sense. The potato is a biennial plant. Biennial plants' competition strategy involves capturing energy from their environment, storing it underground in the form of a starchy tuber, overwintering, and then using that stored energy to out-grow competitors in the spring. Once they've established dominance over a growing area (typically shading out competition with their fast, early growth), they bloom, then start tuber production underground for next season. This last part is the key part here... they can't just capture energy from thin air, they need leaf mass to capture energy from the sun, which the plant then converts to starch and stores underground. The larger the leaf area for capturing sunlight, the larger the tubers can be made underground. Planting after last frost is done with the idea that if you encourage nothing but fast, strong growth from day 1, the tops will be as big as they could possibly be by the time tuber production begins. If they die back and have to regrow, they will be smaller/weaker, maybe more prone to pests, and not as big by the time tuber production begins - resulting in a smaller (if maybe 1-3 weeks earlier), harvest. You also have to take into account your local climate conditions, as if you harvest too late, you could run into problems with storage - so maybe you do need to plant early. Planting later, though, you can use that time to chit the seed potatoes, which also increases early growth. You are, of course, welcome to grow potatoes however you like - you certainly CAN have success planting early (maybe they don't frost back, or just manage to come back perfectly fine) - but I prefer to strive for my plants thriving, not just surviving. I'm always suspicious of comments like "Well, I didn't do that thing that's suggested, but my plants ended up fine." Typically, your plant could have ended up much more than fine if you had. Cheers. I had a really heavy frost on my potatoes around April 4. They are coming back, but the leaves look a little cupped and wrinkly and not all that great. I can see they sustained a trauma. So, I think I'm startin to come around to your thinking, Bri. I'm almost tempted to dig them up and start over. I still have lots of seed potatoes, but they're getting wrinkly. The freeze involved 21 plants though. But, I have a couple of problems in this area. I've found that I like Red Norlands because they are early, but so does everybody else. Hard to get there fast enough to get what I need. So, since the potatoes have already started to chit in the bags, if I wait til at or slightly after last frost, the potatoes have started to wither up and the chits have gone to a foot long or more. I'm thinking that's not good cause they're using up the nutrients in the potato before they ever get in the ground. Wonder if it's ok to buy them, then put them in the frig vegetable drawer til about a couple weeks before planting? Number 2, in this area, I've found that if I leave potatoes in the ground much after Aug. 1, something underground starts working on them. Don't know if earthworms eat potatoes? It's not a big animal like a gopher or I'd see the evidence. Maybe it's not an animal but a form of scab? Don't know. So, that's why I'm always in a hurry to get them in the ground. If I get em out quick, I seem to be ok.
Maybe covering them with a fabric for warmth at nite would be an option. I have always said, Do not plant grocery store potatoes. Ya never know what diseases they may have. Go to a gardening store and get some certified disease free potatoes to plant. Cut the tubers to one or two eyes per piece and plant them. Each eye on the potato sends out a plant. If the tuber has 6 to 8 eyes on it and you plant the whole tuber, you get 6 to eight plants. These are in direct competition for sunlight and water. It is best to cut the tubers to one or two eyes per piece then plant. I haven't planted mine yet because I haven't been feeling well and I haven't been able to get the garden ready. But it's past my normal time to plant potatoes. (I'm getting anxious) I noticed today that the dandelions have started to bloom.... forsythias have been blooming in the neighborhood since last week. Usually if I plant first week of April, the first sprouts don't break ground until about 3rd week of April, which is the last average frost. I've tried planting last week of March -- we had severe lows that made me worry about ground freezing/getting too cold. I think they didn't grow any earlier either. So I'm back to first week of April for my area as a basic timeline. In my garden, it's the wireworms that get into the potato tubers if left in the ground too long past when they are ready to be harvested. Applestar your probably right about larger plants make larger potatoes. I ment to say, if frost kills your potato tops it will not kill the plant under the surface tops will grow back. Potato tops can get frost bit several times and your plants will grow new tops every time and still make potatoes. I planted potatoes a month ago they came up a week ago just in time for Friday night frost. LOL. I covered up my plants they are fine. We are having a crazy spring it has been in the 70s and 80s for a month. In the past 40 years I have seen frost and a hard freeze in May. It was 82 degrees today and I still do not trust the weather yet it is still too early. For the next 3 weeks I will be prepared to cover up my plants if I need to. Nothing we can do about the weather so don't worry about it if plants get frost bit you will still get a crop of potatoes. You do not have to start over like frost bit tomatoes. Frost got my sweet potatoes, now what? Can I still plant echinacea (coneflower) after last frost? Peppers; frost tolerance, off-plant ripening?